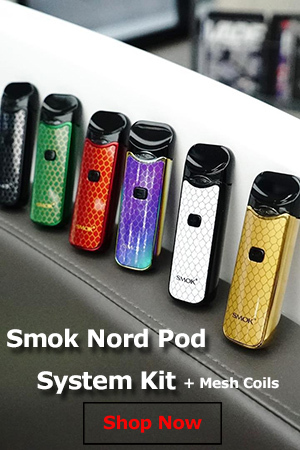 Get a great price on the Smoant Karat vape pod TS from Vapor DNA. 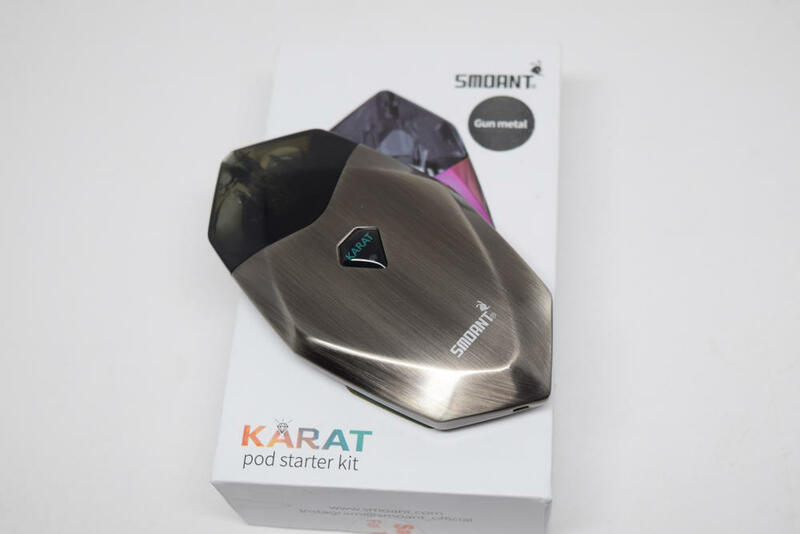 The Smoant Karat pod system comes in small cardboard box with an almost life-size picture of the device on the front, and a list on contents, technical specifications, as well as company information, on the back. Inside the packaging, we have the Karat, vape pod, a whole lot of Styrofoam and not much else. Sure, there’s an extremely short micro-USB cable for charging, a user manual and a warranty card, but the inside of the box definitely looks like a whole lot of wasted space. Anyway, I would have really liked to see a spare pod included in this starter kit, but sadly you only get one, so make sure you don’t ruin it by not letting it sit for a good 10 minutes after filling it for the first time. 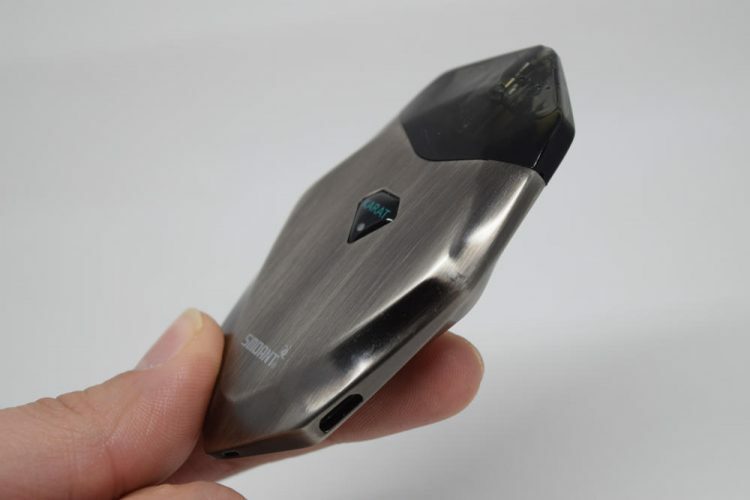 Hopefully, Smoant will start including spare pods in future, because, as I said in other reviews, one just isn’t enough. Also, I really wish companies would include longer charging cables, especially for devices which you’re likely to be using while they are charging. The Smoant Karat is a very small vape pod so it doesn’t have the most impressive battery life, but having it hooked up to a power source means you don’t have to worry about that. However, with the included cable, you have to bend down to your laptop’s keyboard to even reach the pod with your mouth. It doesn’t make any sense, so yeah, longer cables next time, please! 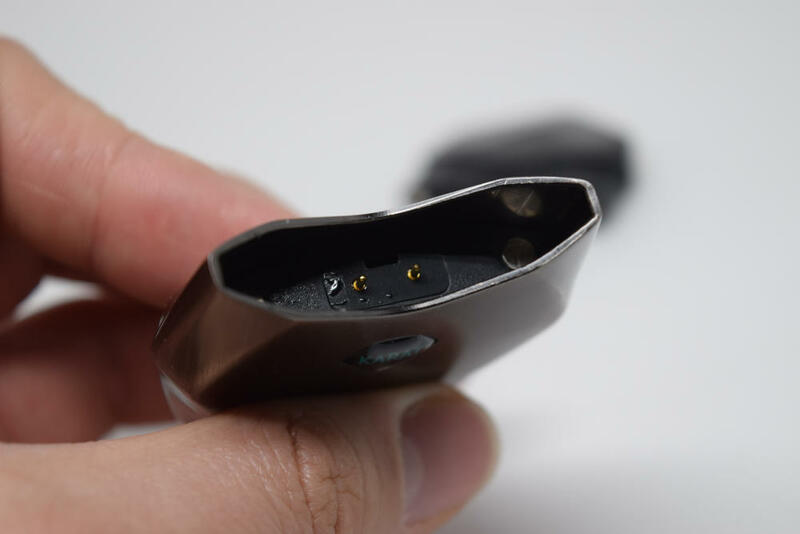 As I mentioned in the introduction, the Karat pod system has a very similar design to the Smoant S8. It’s just as wide and as thick as the S8, and only two mm longer. And while it retains the same general design, the Karat has sharper edges to give it that diamond look that its name hints towards. The edges are beveled, so it’s still very comfortable to hold in your hand, so no problems there. The Smoant Karat battery casing is made out of zinc alloy and comes in various color combinations, from the classic black to rainbow. For this review, I received the gunmetal version, which I personally consider the most attractive of all variants. It just looks amazing, and has a brushed finish that I prefer to the glossy one of the other versions. From a purely aesthetic this is undoubtedly the best looking pod system I have ever used, and that’s saying something. 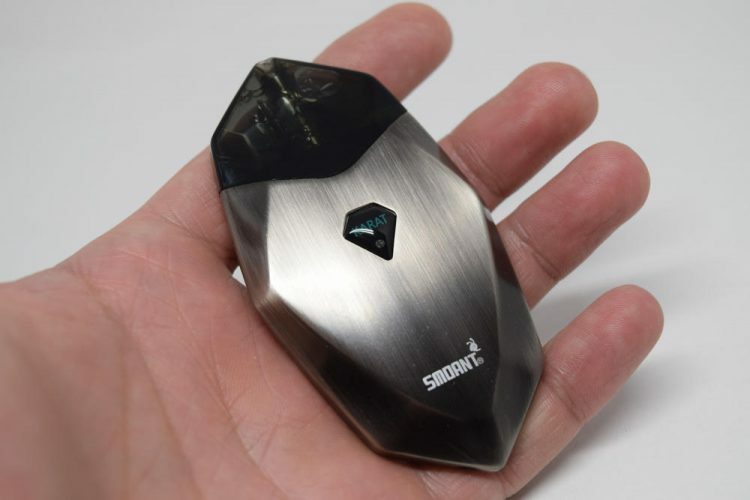 The only thing I don’t particularly like about the Smoant Karat is the blue “Karat” test in the decorative diamond-shaped logo on the battery. It doesn’t match the color of the gunmetal version at all, and even though it’s not a big deal, I find it a bit annoying. Other than that, the device looks stunning and feels really solid as well. 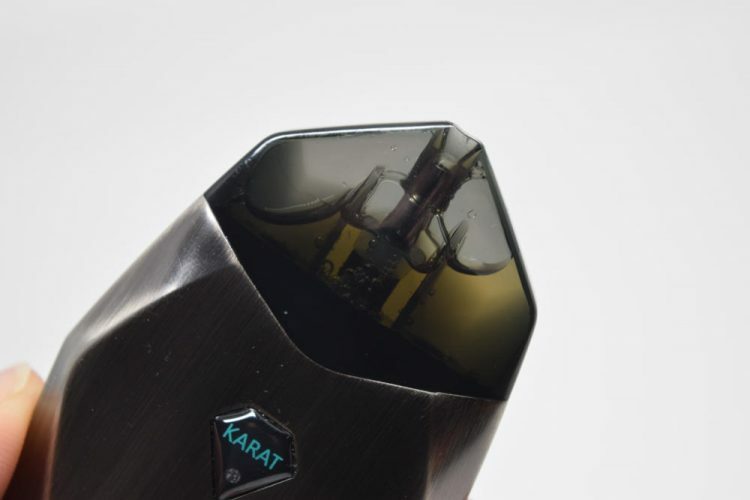 Technically, the Karat works the same way as the Smoant S8 and other similar pod systems I’ve tried, like the Suorin Drop or Mowell Shake. 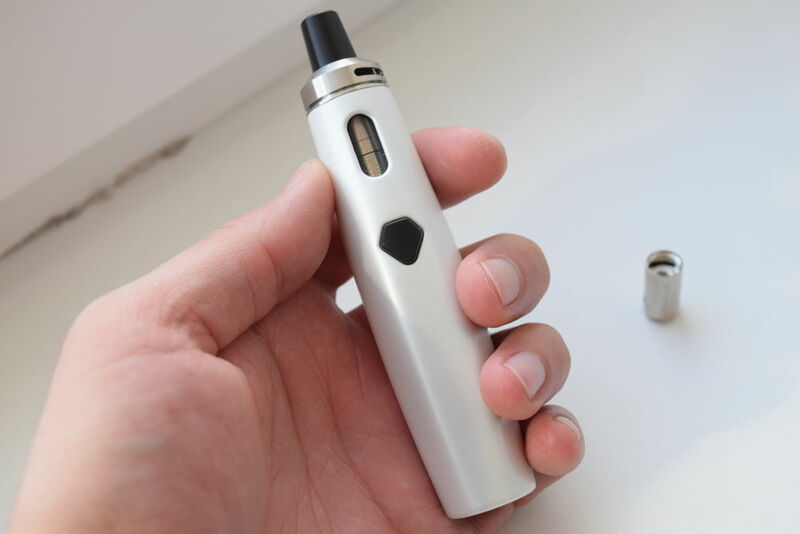 It comes with tinted 2ml pods that attach to the battery via 2 pairs of magnets. Just drop the pod into the loading bay and you;ll hear it click into place. But before you do that, you should first fill it up with juice. The 2 fill ports are located on the bottom of the pods and are sealed with rubber caps that you have to yank off with your fingernails. 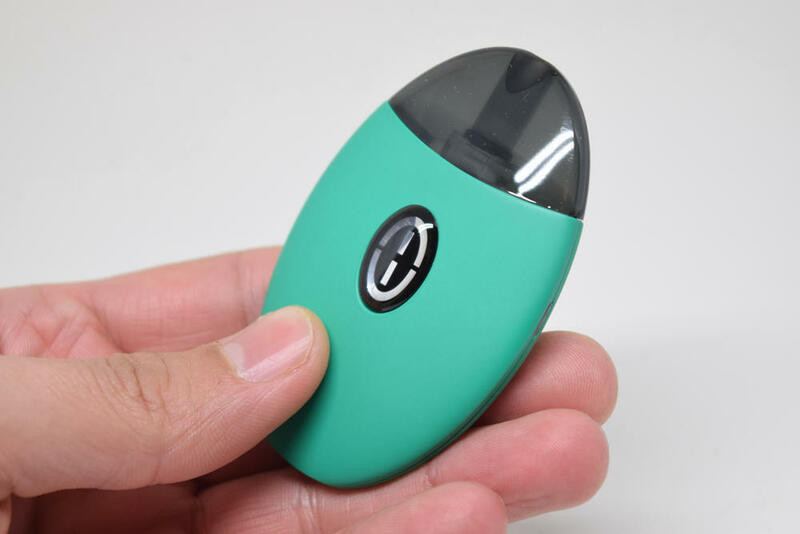 The fill ports are fairly large for this sort of device, but I recommend uncovering both of them when filling the pod, to allow the air inside to exit and avoid spillage. Once you’re done, just put the rubber caps back in, clean the metal contact on the bottom of the pod, hook it up to the battery and let it sit for a few minutes. 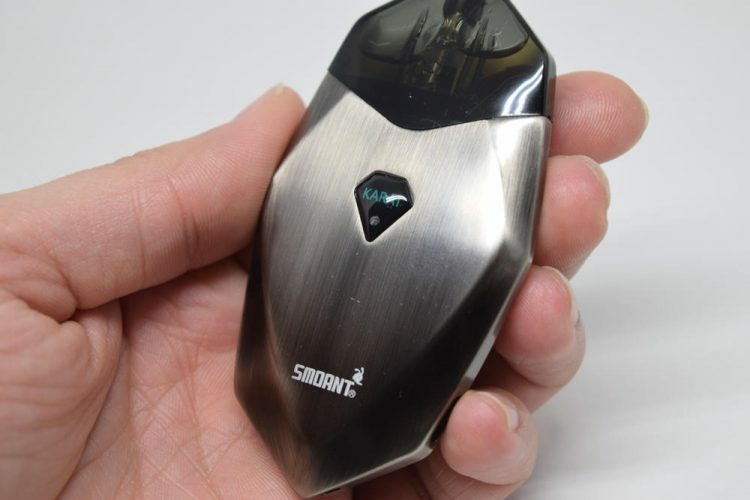 One of the most intriguing things about the Smoant Karat is the new quartz coil built into the pods. You basically have a spaced coil baked into a ceramic-like hollow cylinder, with a layer of cotton wrapped around it for better wicking. At least the material looks like ceramic, but maybe it’s something else, I’m not sure. All I can say is that the company claims that it’s a “microporous material” that shortens the break-in and priming time of the coil, improves flavor and extends the life of the cartridge. That all sounds lovely, but I’m guessing part of it is marketing, as usual. 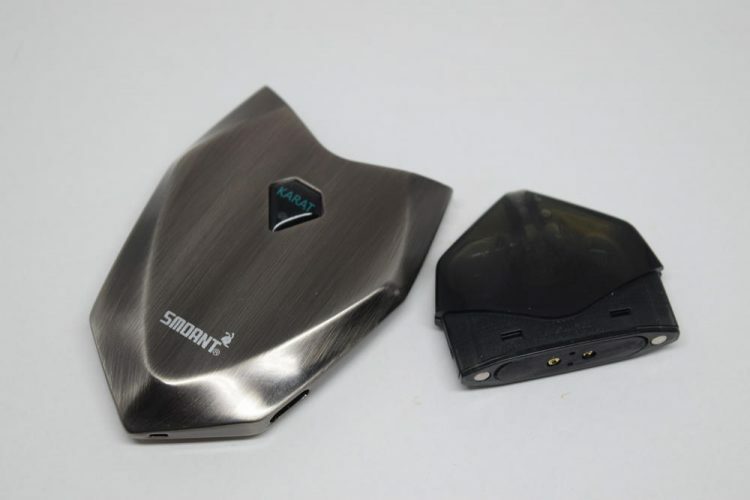 Just like the S8 pod system, the Smoant Karat features a built-in 370mAh battery. That’s very close to the industry average of 400mAh, but I personally would have preferred the device to be a bit bigger and have slightly better battery life. Don’t get me wrong, 370mAh is decent, but having tested devices like the IQ OVS or Eleaf iWu, which have 600mAh batteries or larger, I’ve sort of gotten used to the convenience of not having to worry about charging for almost an entire day. With the Karat, I had to hook it up to a power source about twice a day on average, which is not that bad, but still, battery life could be better. The nice thing about the Karat is that you can vape on it while it’s charging, just not with the included micro-USB cable, which is ridiculously short. The device also features an LED battery indicator embedded in that decorative diamond logo I mentioned above. When the battery level is over 30%, it lights up blue, and when it’s under 30%, it lights up red. The Karat vape pod is a regulated voltage device, which theoretically means that it is outputting 3.2V – 3.4V at all times, giving you the same vaping experience regardless of battery level. However, in my experience, when the battery level drops under 30%, you can definitely notice a drop in vapor production and vapor temperature. It’s not abysmal, but it’s noticeable. However, the same happens with my other regulated voltage pods, so I wouldn’t call that a con, just an observation. In terms of performance, I can’t say I’ve been overly impressed by the new quartz coil. In fact, I have to point out that it does actually need some breaking in, so if you get this weird taste when first vaping on the Smoant Karat, just give it some time, because the flavor does get better. I personally vaped through a whole 2ml of e-liquid before the flavor really started to kick in. So, yeah, this new coil has a slow start, but it gets there eventually. One thing I like about these new Karat pods is that they have a really narrow chimney and tight airflow slots, so you get a tight draw, similar to that on a tobacco cigarette, which is what fresh ex-smokers are looking for. The vapor production isn’t that impressive, but that’s not what this device is designed to do. 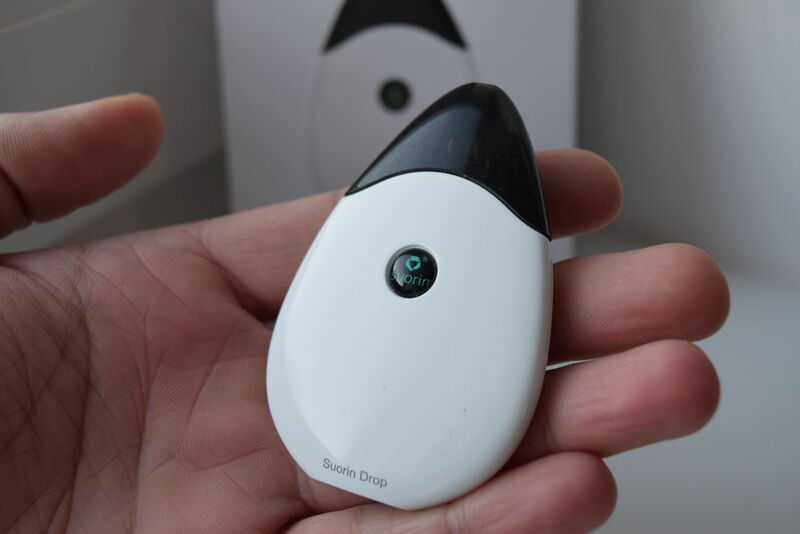 It’s supposed to give you a good throat hit (provided the nicotine strength is there as well) and emulate the smoking experience, both of which it does very well. I’ve only been using the Smoant Karat for about a week, but so far I’ve had no issues with it. The coil is still going strong – granted I am using an unsweetened, clear e-liquid – I’ve had no leaking issues, and the draw-activated switch has been very responsive. The Smoant Karat is the best-looking vape pod in my collection, but there’s more to this device than good looks. The build quality is there, the ergonomics as well, and performance is not too shabby either especially if you like a tight draw. That said, I can’t say I’m overly excited about it simply because it is so similar to the S8 pod system. If you already have that, I don’t really see the point of getting the Smoant Karat as well. Except for the new quartz coil, which doesn’t seem all that special to me, they’re basically the same device, with slight design differences. The Smoant Karat pod system was sent to me directly by Smoant for the purpose of this review. I like the way you review these e cigarette, personally I own Smoant Karat and Renova Zero, and I use Zero most of the time. I am having a hard time sucking air out of my karat as compared to the zero, and the zero produce more heat. That is also maybe because i switched from smoking high flavoured cigarette (Not sure if you know what is DUNHILL RED or not). You should try reviewing Renova Zero if possible. Thanks for the kind words, Jun, I really appreciate it. The review for the Renova Zero is coming soon, it was stuck in customs for a while, but it’s on its way. 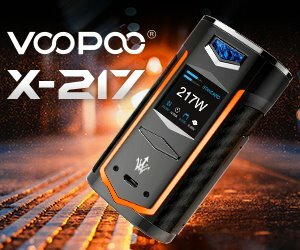 As far as I can tell without trying it, it’s similar to the Wismec Motiv 2, which has a looser/airier draw. I personally prefer the tighter, cigarette-like draw of the Karat, but I think the Motiv 2 is a good pod system too. This is my Juul replacement so not very experienced or impressed. 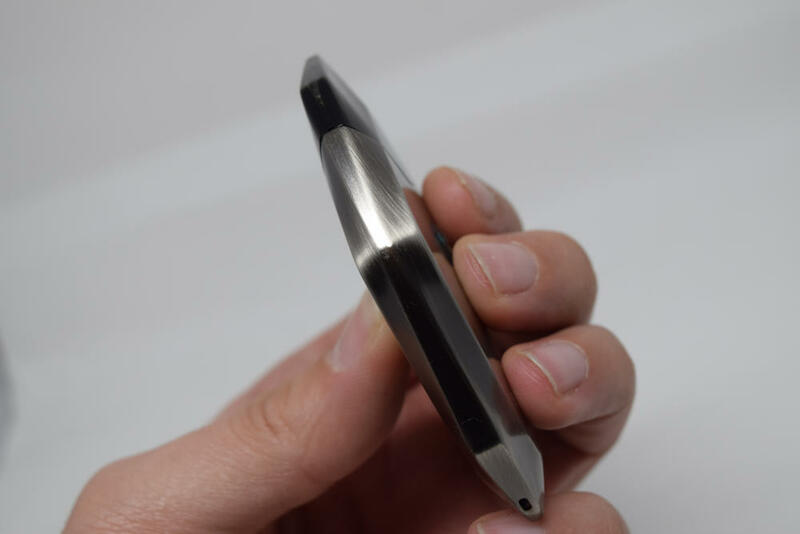 I agree with you about the brushed gunmetal, upon receiving mine I immediately thought I made a mistake by buying high gloss black, never not going to be covered in fingerprints. Worse, it’s kinda greasy because it leaks. I was shocked that all it had were little friction stoppers. I clean constantly, 5-10 minutes, make sure it’s spotless to reduce wicking, doesn’t matter. I notice in your photo yours has leaked on the battery compartment as well. I assume this has been a problem for you? Unfortunately I bought 10 pods planning to travel overseas. Is this just how they all are? Kinda killing my interest before I really get into it.